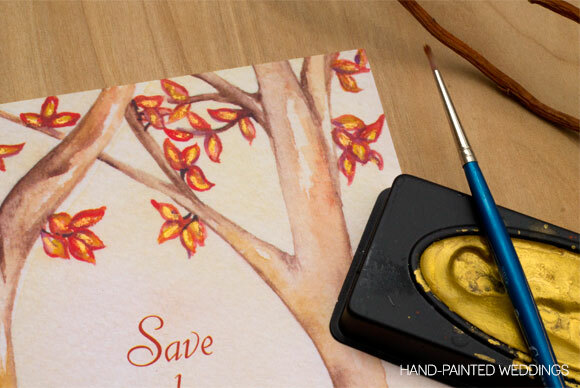 Autumn invitations…my favorite! I worked with the bride, Katie, to create her custom Invitation package including their Save-the-Dates. 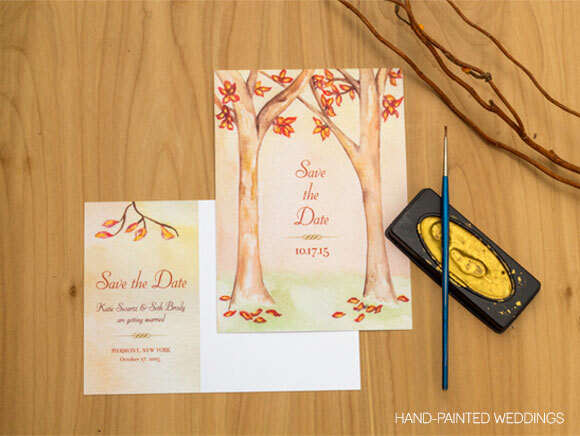 The Autumn Save-the-Date features two trees with intersecting branches which subtly symbolizes the strength of each tree (or person) as they intersect their lives together in marriage. The invitations are an extension of this design and zoom into the branches further…but I will share with you the invitation designs tomorrow! Katie chose to have her Save-the-Dates as postcards. One little tip I like to give couples who choose to send out postcards is to ask their local post office to hand-cancel their postcards. Many couples choose to do this for their invitations as well, but particularly for a postcard, you’ll want to add that special attention. The reason I push this for postcard in particular is because some of the machinery that pulls the postcards through for metering tends to scuff up the cards. Not every post office does hand-canceling so be sure to inquire ahead of time, and drop off your Save-the-Date postcards or invitation sets during a slow time at the post office. This couple also decided to have a little gold shimmer added to their designs. This is a great alternative to gold foil. I printed the Save-the-Date postcards and painted shimmery gold watercolor accents to the leaves on the front and back of the design. In the light, these gold accents shimmer beautifully!! Gold is all the rage these days, and it is perfect for autumn weddings, so if gold foil is not in your price range and a little too structured in design for you, consider adding a hand-painted gold shimmer to your order. 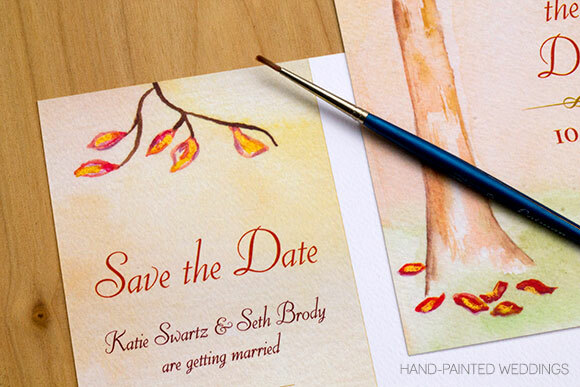 Custom Autumn Wedding Save-the-Date Postcard by Hand-Painted Weddings.